The Bits and Byts team competing in the in iGovTT's inaugural hackathon, HackTT. 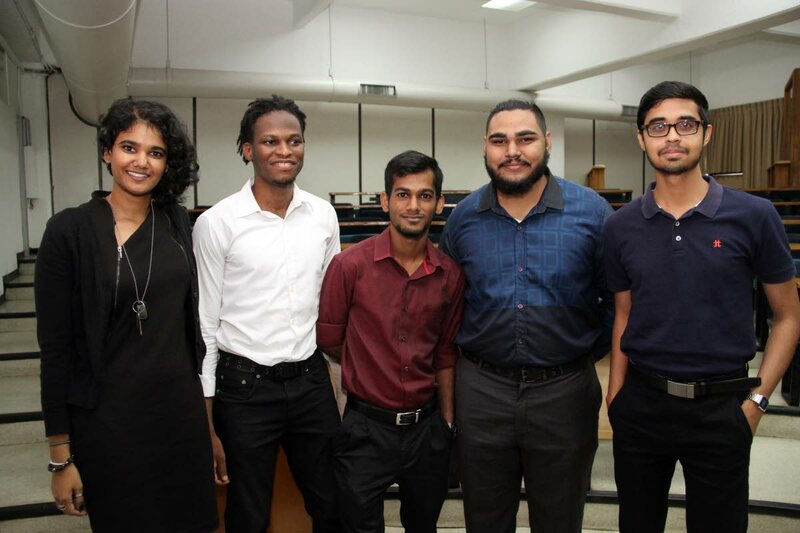 From left are Abigail Ramkissoon, Caleb Beard, David Ramjit, Usman Mohammed and Nicholas Singh. Nicholas Singh, 23, has wanted to work with computers since he was in form four and first started studying information technology. He is interested in electronics and computer systems, smart devices, and making smart homes. He knows three computer coding languages: Python, C++ and Java. And he hopes to reduce the amount of paper used in the country through technology. Caleb Beard, 23, has been interested in science, technology engineering and mathematics (STEM) subjects since primary school, but he wasn’t sure what field to go into. Doing electrical work with his dad inspired him to pursue it as a degree. Now, he wants to use the internet of things to make life easier for pet owners. David Ramjit, 22, loves physics and all things electrical. Abigail Ramkissoon, 23, comes from a family of engineers who encouraged her love of all things STEM, especially her uncle, who was always fiddling with computers and helped build her love of computers and coding. Usman Mohammed, 21, has always loved all things electrical because of physics and he loved that his programme had computer science attached to it. By their powers combined, these five budding software engineers form Bits and Byts, a team of friends, who also happen to be students at the UWI St Augustine's Department of Electrical and Computer Engineering. Bits and Byts is one of the teams competing in iGovTT's hackathon, HackTT, launched last month and featuring 100 tertiary-level computer science students from seven tertiary education institutions to create programs that can help solve three major ICT problems in the public sector – transportation information (ttcommute), job vacancies (employtt) and appointment booking (eappoint). Bits and Byts has been given eappoint and team members are excited about their challenge and ready to change the world – starting with TT. They all agree that there should be a greater integration of "the internet of things" in everyday life. The internet of things, or IoT, according to the website Internet of Things Agenda, is a system of interrelated computing devices, mechanical and digital machines, objects, animals or people that are provided with unique identifiers and the ability to transfer data over a network without requiring human-to-human or human-to-computer interaction. “In Trinidad there is a lot of paperwork and applications, and we have to apply through paper and not through electronic means. This project is what I wanted to solve on my own to make a centralised appointment programme,” Singh said. Offices like the Ministry of Works or medical institutions all have a lot of paperwork to sort through, but if a proper database was created for the government institutions then there would be better ease of access for both public servants and the citizens who want to access these services. “What we need is an electronic database. This project motivates me,” he said. Beard thinks he could use the internet of things to help monitor the eating patterns of his animals. “I have a lot of cats, and I think that we could use the internet of things to make life easier for pet owners and vets. I don’t think in general we use the internet effectively in Trinidad. I could be out of the country and I could be able to monitor how much my pets are eating, if they are eating at all and they could tell me. One (way) you know if they are sick, is if they are not eating. We could use the internet of things to pick up on what is going on with them,” he said. Even beyond pets, IoT could help make life a lot easier for people. In conjunction, he said, the country needs effective search engine optimisation so information could be found easier online. “The world is changing right now, we are in a communication age, an internet age and everything is electronics, that is why I came into this Department of Electrical and Computer Engineering,” he said. Ramjit recognises a need for proper data gathering and collection. “We are in the age when data analytics is a big thing. We in Trinidad and Tobago should be gathering data on important stuff. I want to see this data be used to improve basic services such as public utilities, infrastructure,” he said. Ramjit wants to use his degree programme to develop the environmental landscape of the country. “I had a dream when I was younger to make the place better through renewable energy. I see potential in Trinidad for that in the future,” he said. Mohammed thinks the country needs easier access to equipment. “One thing I know for sure TT could change is accessibility to equipment needed in our field. If we need a part for a sensor, most likely we have to outsource it. The time taken to ship it in, there’s a cost to that, versus if we could (find it) locally. If Trinidad could have a market locally to purchase sensors, microchips or micro-controllers we could use that to encourage future students to practice on,” he said. Mohammed hopes to one day have his own company. The participants of HackTT, a hackathon for tertiary level students hosted by iGovTT. “I would like my company to develop solutions based on electrical and computer work – complicated ones for telecommunications,” he said. Ramkissoon, the only girl in the group, acknowledged that when she started university, there were only a handful of girls in class. She took a year off, and when she returned she noticed the number of female computer and electrical engineering students had grown. "It is changing. I am from a different year from the rest of my team. In my year group there were a handful of girls, and as we watched the new year groups come in I watched more and more girls come in. And there are a lot more entering and staying," she said. She would like to see a more accessibility to a centralised information system. “In America you could look up something and get the information accurately, as soon as you look for it. Here, it’s word of mouth. But if we could, we should centralise it into a platform where you could get information. We should get more unified information, to share information on anything, restaurants or traffic,” she said. Ramkissoon would like to be a coder after she graduates, but understands the job market in the country is limited for people with skills such as hers. While remote jobs are a possibility for her, she would like to be employed by a company in TT. For now though, the immediate challenge for Bits and Byts is beating the other 21 teams competing in HackTT. Next month, the first cut begins, and the 22 teams will be reduced to 12. If Bits and Byts manages to make it to the end, as one of the top three teams, all five members will earn internships, which could lead to them getting full time jobs. Reply to "Changing the world by Bits and Byts"